thanks for trying to help, nomake. Image size reduced, original size: 1360 x 768. Click here to view the image in its original dimension. its running the game at 30fps instead of 60. did i have to patch the game or something? its basically staying on 30fps even through the menus. What are your PC specs? Also your monitor refresh rate? Image size reduced, original size: 1390 x 854. Click here to view the image in its original dimension. Your PC should be more than strong enough to run this at 60FPS. This is weird, I’ve never seen the game locked to 30 before. I suspect this is a laptop? A. Go to Nvidia Control Panel and set V-Sync to On. B. 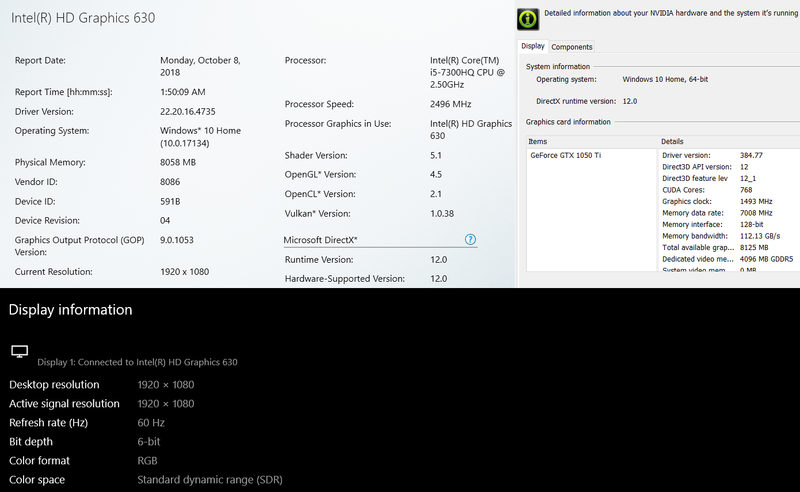 Also, in Nvidia Control Panel make you sure set it to run using your dedicated graphics card when launching any programs. In this case make sure it’s set to Nvidia GTX 1050 Ti and NOT to Intel HD Graphics. C. Run the game in Fullscreen Mode, if you haven’t been doing so already. Just go to TP Emulation Settings and untick Windowed Mode. Do all these and play the game again. Then report back with the FPS numbers to us. yeah, this is a laptop. i tried to hook it up to my tv to see if it would fix anything, but no changes, except the video resolution, but i dont really care to try to fix that right now. v-sync was on, i messed with it for the days i tried to get this to work before asking. it also has been running on the nvidia card, i changed that a while back to. without doing that, old games (for example ultra street fighter 4) wouldnt be smooth at all. See PM and hope that might help you out. The last kitchen sink I can throw is to go to Control Panel, Hardware and Sound, Power Options and clock High Performance option. thanks, i dont have discord so i was going to try that as a last resort. surprisingly, putting high performance (had to make the option btw) did not work. the problem was that since this is a laptop, it just absolutely refused to go past 30fps, no matter what setting, no matter what i tried, it just refused to go higher, even though i know this laptop, a gaming laptop btw, is really strong + new. i was really just ready to give up completely. so now, i read somewhere that someone had a 30fps cap on their laptop to (unrelated to initial d + teknoparrot), and someone else said that it had to do with keeping the battery safe or something. what i did was plug the charger into my laptop (its on 100% battery everytime i tried btw, so power itself was never an issue enough for me to try making the game work with the plug in), and after plugging it in, the games fps is just...insane. and kinda funny. just playing the game for a minute made the fan real loud though. it goes around 200-450 fps now instead, including menus and the race itself. so now instead of being to slow, the game is too fast. me being someone who pretty much only plays on consoles, i didnt even know games can go over 60fps. the game even automatically clears a few turns before i even get to control the car XD. so now instead of needing help to speed the game up, it is too fast now. Image size reduced, original size: 1356 x 765. Click here to view the image in its original dimension. so for that, turning v-sync back on fixed the game being too fast, messing with settings minutes after i tried high performance as a last resort, it automatically turned v-sync off in the first place and changed some other options. so in the end, if someones on a laptop, they should leave the charger in, leave v-sync on, leave the laptop on 60hz, and everything should be good. i apologize for this being a real strange case an all, i dont expect many english speaking people to want to play initial d on a laptop, hahaha, but i hope that this struggle at least helps someone in the future. thank you so much for sticking with me on this. Really glad you managed to solve the issue. I’ve personally never knew they were laptops that limits FPS so this is something new to add for future cases. I knew something was off when the game was locked to 30FPS. We’ve seen some cases where weaker setups have trouble keeping a consistent 60 but locked 30 is new. Usually manufacturers usually downclock the CPU as opposed to locking FPS outrighr. And the game in in general isn’t too demanding on most PCs (though a dedicated Nvidia or AMD GPU is needed), wanting to play on laptop is normal. Your laptop is even stronger than the original arcade machine lol. So if you have any questions related to gameplay, feel free to ask. theres probably a setting to change it so it can run 60fps while its not plugged in, maybe thats why its not common? i cant find anything that makes the settings the same for plugged in and not plugged in though. hahaha, im not surprised this laptops stronger though, its still brand new, i got it this year. 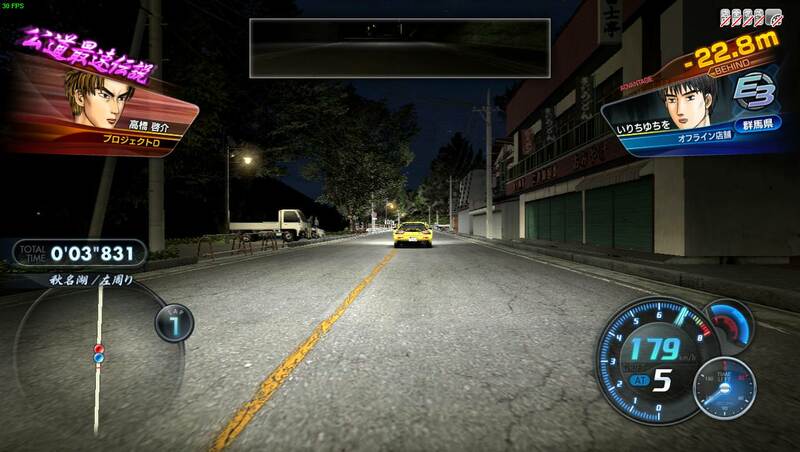 i played initial d on psp/ps2/arcade for 100 hours, and never even knew if i was drifting correctly the whole time, this game making "drift" light up was so helpful. i feel like im turning poorly though. is there a trick to this? i upgraded my car and played for 2 hours, so i know the turning slowdown thing is part of the game. and after playing the arcade one (whatever the english translated one is), its hard to go back to controller when a steering wheel was much funner. is there a good one out there that runs with this game? for now, im using a ps4 controller and its perfectly useable, so its no big deal if there is none, im just happy to play the game. - Different laptop manufacturers have a lot of different hidden settings in their laptops to make sure their batteries don’t die fast or overheat. So my guessing is limiting to 30 is just one that’s not used very often. Super weird to do it to a laptop that’s running a GTX 1050 Ti though, even unplugged. You might want to look up forums of your manufacturer and see what users say about bypassing the settings. - Turning slowdown is only for cars that have not reached Full Spec. Once you reach the upper levels of tuning the real game physics will be unlocked. Don’t worry about playing poorly before reaching Full Spec as the car is pretty limited by design. Heres a D7 gameplay video I made for the IDPLAYERS TA competition some weeks back for example. If you haven’t reached Full Spec, or at least Spec 5, it would look very different to the gameplay you are experiencing. Starting with D4, physics of IDAS changes a lot from game to game. In D7, it’s all about using as little brakes as possible as they are really strong and will slow you down a lot. When you BC (the tap brake and accel thing you do), you want to tap the brake as quick and lightly as possible - enough to initiate the drift and no more as any more will slow you down. - Most of the mainstream wheels will run this just fine mostly (like Logitech G29 and the Thrustmaster ones). I would even argue that D7 is more fun with a Gamepad than a wheel (and I have a wheel). D8 though is more funner with a wheel IMO. - When playing using a Gamepad, make sure Sto0z Settings is on and set to something you like (it’s in Emulation Settings). In the video I posted for example, I was using 26%. Sto0z Setting is for deadzone in the analog stick younise to turn so adjust it to your liking. i will sometime, thanks. never knew stuff like that existed, i thought laptops where basically the same as pc. thats a weird design choice imo. its no huge deal a few specs in, but still noticeable. very weird. imo, i think this game so far is much easier than the others i played, so its not too annoying right now. yeah it does look faster, much smoother when turnin corners an stuff. nice song choice, thats what i play to also, hahaha. does it? before playing it, i always thought itd feel nearly the exact same, but just updated graphic-wise an stuff. thats what i do, light taps. thanks for confirmin it though. thats real pricey. gonna have to save up for it and get it later since it is compatible with ps4. to bad theres no good ps4 racing games though, haha. why do you say its funner with a gamepad though, specifically part 7? does it have to do with the physics changes? ill check out that setting, i dont think i ever put that on, thanks. Why do you say its funner with a gamepad though, specifically part 7? does it have to do with the physics changes? Starting with 4 and all the way until 0, each IDAS game is kinda of unique. Their physics and rules are basically quite different for the most part. I just think it feels a lot nicer to BC with the gamepad in D7 physics than with the wheel. And I say that as someone who played the arcade version as well. Mind you the game is still fun with wheels, I just surprisingly find myself enjoying its gamepad more. And I played with the arcade wheel and my home wheel before playing the gamepad. D8 by contrast, personally for me is not as fun to play with Gamepad and way funner with a wheel. The footwork is so much fun and it feels great with real pedals. after spending a little time with part 8, i see what you mean now. using a ps4 controller for both, it felt much better using it for part 7 than it did part 8. i noticed that 8 cheats right away during your first race to XD. You won’t be able to tell until you are finished with Spec 5 on both though. D8’s real physics are only unlocked on the last box of Spec 5. I know some people prefer D8 on Gamepad though, it’s just that I prefer it on wheel. So happened that I also made a Nagao DH (it being my favorite course) run on D8 recently, so you can compare it with my D7 one if you want to get a good idea of the physics differences between the two. Though the D8 one is made with a wheel. guess im speaking too fast than, hahaha. right away though, first spec felt different, but anyways, i see what you mean. that does look different from what i experienced, again. i should reach spec 5 in both games before i start comparing instead, hahaha. 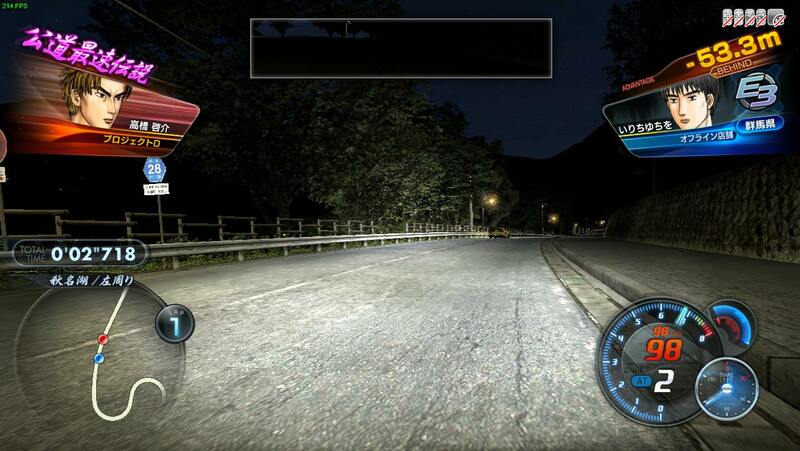 btw, have you tried wangan midnight? i tried it on psp and was really bored, but im just wondering if the arcade ones worth giving a chance. Wangan is generally fun with a few multiplayer friends (especially in a real arcade with lots of people), alone it’s more boring. Personally I’m not a big fan of it even in multiplayer, the highway course design is just not my thing and I only enjoy the mountain courses. It’s really popular though so maybe it’s worth trying out to see if you like it. Find a crowded arcade and play with other people (though a fully tuned car is recommended less you be crushed). ^There's Wangan 5 on Teknoparrot as well if you want to try it. IMO I love driving touge more, but the racing in Wangan due to traffic and the speeds involved can be even more frantic. 4 way multiplayer is always a hoot too (if everyone plays clean). It's got 2 touge courses (Hakone and Turnpike) as well. The boring part comes when you are solo time trialling. There's a course where you spend 20 km on the straight just going full throttle with no braking lol. i might, thanks. and thats what i did, solo time trial, thats probably why i was so bored (was learning the game first but was to bored before even a single real race). Wangan doesn’t have online multiplayer support on Teknoparrot if I’m not mistaken, only local over LAN. The real arcade version doesn’t have online multiplayer support either. Even IDAS has to do a lot tricks to make its 1v1 official online multiplayer seem seamless by hiding the lag and ghost and all. Personally Wangan Time Attack is funner that Story Mode for me as you get to focus on your actual performance than all the long story text thingies. Yeah, I know Tekno WMMT doesn't have online. I was referring to local LAN battles in the real arcade machines. The ghost battles (aka Crown battles) are the closest thing you can get to online I suppose, and even that is not real time. It's also stupid because you are battling a ghost, but they are not transparent and can still block you on track! I agree Wangan story mode is a drag. The last few chapters are intense but everything up to that point is just filler. What I like though is once you finish story mode, your car is fully tuned. Unlike ID where you still have to grind lots after completing all races. Apparently D4 and D5 physics are fixed if you use Teknoparrot 1.80 and use Fullscreen Mode (meaning untick Windowed Mode). Hey guys, So I was bored yesterday and after 6 hours I got ID 8 working on my pc perfectly. super happy. and im using AMD so im even more stoked. Quick question. Im using a t500rs wheel. I have changed some feedback settings in teknoparrot based off people online with similiar wheel. I do have feedback but its very choppy. if im sliding in a turn its very loose almost non existant, if I am turning into a turn its there fine, but its is not a fluid feedback, like it feels like it just cuts on and off quickly. I just dont know which settings in the teknoparrot do what. The FFB in IDAS games are not that great unfortunately. If you're used to sim racing, which I assume you do having a T500RS, then it will feel very weak and undetailed. Having said that, I didn't play much of the actual arcade so I can't vouch how accurate it is in Tekno. Wangan in Tekno feels ok, but IDAS I just can't get comfortable with. So much so that I prefer playing using a pad actually. 1000 is pretty much zero effect, so you can try out what each setting does by putting the rest to 1000 and increasing the one you're testing. From memory Sine is vibration effect (when running over kerbs), Friction is damper, Spring is centering spring and Constant is the main FFB torque.